Achillion, the palace built by the empress of Austria Elisavet, in Gastouri village, is the ornament of Corfu. It was built at the end of the 19th century by the queen of the Austro-Hungarian empire Elizabeth, known as Sissy, who was charmed by Corfu's beauties and mythology, wanted to make her own ivory tower. Sissy came for the first time in Corfu in 1861 and stayed in Mon Repo, as a guest of the English commissioner Henry Stocks. Her acquaintance with this beautiful island was enough for the "melancholic Empress" to love Greece and to want to know more about its history and mythology. Some years later, when her son died, Sissy wanted a shelter away from her country in order to find her old self. So, she returned to Corfu and bought villa Vraila in the graphic Gastouri. She torn down the old building and built her palace, Achillion, in honor of the hero from the Troic war. The mansion is of neoclassic style, grandiose and imposing. Its characteristic is the many statues that show features from greek mythology that decorate the interior and exterior of the palace. In its interior highly impressive are the murals with vivid colors from famous painters of that time. In the ceiling of the reception room you will admire the fresco showing the four seasons, while on the top of the staircase the grandiose oil painting with the triumph of Achilles. It is a work of the Austrian painter Franz Matsch and was made in 1892. Sissy built in the interior a small catholic church in order to pray. Inside the church are made remarkable works of ecclesiastic art. Achillion is famous for its wonderful gardens that are decorated with exotic flowers, palm trees and many age long trees. But the most impressive part of it is the statues. In the palace's entrance you can see statues of the Olympian gods. Highly impressive is the peristyle of 9 Musses. From Achillion couldn't miss the statues of the emperor's favorite hero. 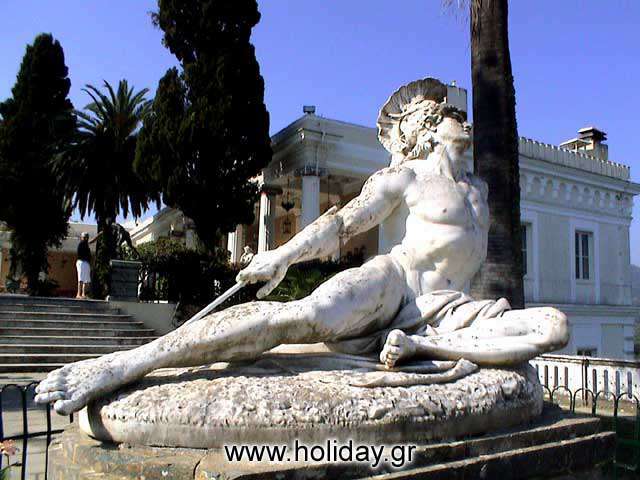 A distinctive place in the garden has the famous statue of "Thniskon Achilles". It is made by the german sculptor Herter, who made it in 1884, showing wounded Achilles trying to pull the arrow out of his heel. Also the brazen statue "Nikon Achilles" of 8m height, showing the homeric hero imposing and grandiose. In 1898, Sissy was murdered in Geneva. For several years Achillion remained closed. In 1907 it was bought by Goulielm Kaiser The Second, who made his own changes to the building. During the First and Second World Wars the palace turned into a hospital. In the years followed it suffered a lot of catastrophes and lost its glow day after day. In 1962 the Greek Government rent it to a german company in order to renovate it and make a casino. Baron Fon Rihthofen managed to gather many of the missing parts and give the palace back its old glory. In 1994 the Greek State took over Achillion. Since then it operates as a museum.